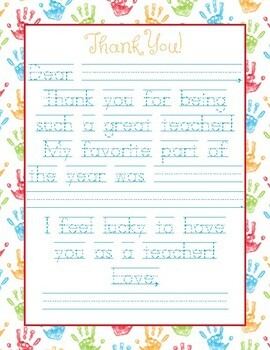 Cute fill-in-the-blank teacher appreciation printable or end of year letter to teacher that your child(ren) can trace and fill in. Perfect for Teacher Appreciation Week, the end of the school year or any day you'd like to make your child's teacher feel special! Cute hand prints make the note fun. You'll receive a high resolution .pdf that prints out on letter size paper (8.5" x 11").